Two New Mexico police officers accused of killing a homeless man will be charged with murder, the state's district attorney announced on Monday. 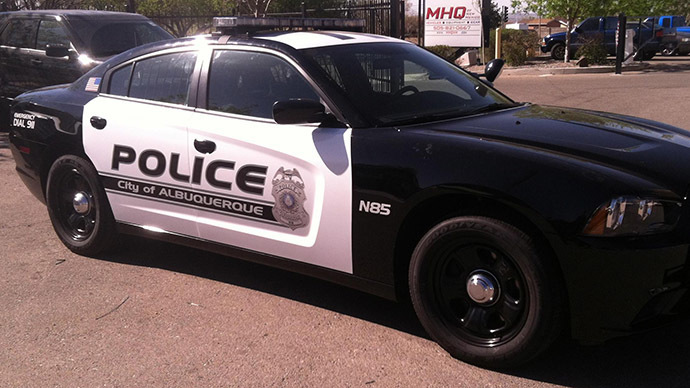 They are the first charges against Albuquerque officers in connection with shootings. James Boyd, a 36-year-old homeless man diagnosed as schizophrenic, was shot by the Albuquerque PD after he became engaged in a four-hour standoff with the officers who caught him illegally camping in the Sandia foothills. Boyd was armed with two small knives, which he appeared to brandish towards an officer with a dog. He was pronounced dead the next day. At a press conference five days after the shooting, Chief Gorden Eden told reporters that he believed the shooting was justified because Boyd made a “threatening” move toward the officer with the dog. Boyd had an extensive criminal past, and mentioned killing the police earlier during the encounter. Bernalillo County District Attorney Kari Brandenburg filed paperwork Monday charging former Albuquerque Police Department (APD) Detective Keith Sandy and APD SWAT Team member Dominique Perez with one open count of murder each in the March 2014 shooting death of Boyd. Sandy and Perez will face a preliminary hearing before a judge who will decide whether there is enough evidence to proceed with the charges, Brandenburg’s office said in an email release. No date has been set for the court hearing, the Albuquerque Journal reported. Brandenburg filed the charges via criminal information papers, allowing her to charge the officers without presenting evidence to a grand jury. Grand juries have declined to indict law enforcement agents in several high-profile, officer-involved shooting deaths over the last several months, including in the cases of Michael Brown and Eric Garner, leading to widespread protests across the country. Lawyers for the two men argued that they will both be cleared of wrongdoing. According to the Huffington Post, Sandy was fired from the New Mexico State Police in 2007 over allegations of fraud. The APD has been under fire since the Boyd shooting. Less than a week after the homeless man’s death, the department released video footage taken from the helmet-cam of an officer on the scene of the crime that shows a cop opening fire on Boyd while his back was turned. He was the first of three shooting deaths involving the department in five weeks: On March 25, the APD shot and killed another man, Alfred Redwine, following an armed stand-off. Three weeks later, Albuquerque police shot and killed Mary Hawkes, who was suspected of stealing a truck. The US Department of Justice conducted a 16-month review into the police department in New Mexico’s largest city, and recommended a “systematic change” in the final document. The early April report found that the APD had fallen into a pattern of using force more often than necessary which, consequently, caused a number of unjustified fatal shootings by officers in recent years. APD has been involved in more than 40 shootings since 2010, resulting in 27 deaths, the Journal reported. In October, the police department reached a deal with the Department of Justice to overhaul many of its practices. The reforms involve new training and recruitment procedures and field supervision of officers, and will require the department to employ body cameras on its officers. Additionally, the APD will begin monitoring every use of a Taser, and officers will have to report every time they point a gun at another individual, regardless of whether or not it is fired.